For more than 15 years ArtQuest has specialized in American handmade quilts, one of a kind hand woven tapestries and rugs from Poland, woodcraft, pottery, fiber and metal arts. The whimsical and imaginative gallery is a favorite for artistic jewelry, unique handmade gifts and home decorative accessories. Locals rely on the shop’s selection of inspiring gifts for friends in need of a little pick-me-up, unique pieces for the person who has everything, and even a new piece that will set their home apart from the neighbor’s. Thank you for visiting our online boutique; we invite you to stop by our brick and mortar location next time you’re in the Chicago area. 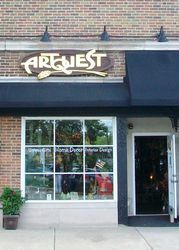 We are located in the western suburb of Hinsdale – about 17 miles West of Chicago. Our business is simple. We find the right art, we price everything fairly. Have a great staff and treat people the way they would like to be treated.